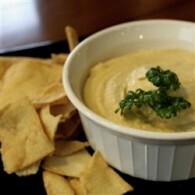 As part of the Mediterranean diet, you can enjoy delicious recipes like this Real Mediterranean Hummus Recipe. Hummus is one of the main ingredients in our 28 Day Mediterranean Diet Plan Book. Most of the recipes take 10 minutes or less to make, and the ingredients are readily available. Our authentic restaurant recipes have been analyzed by Dietitians, endorsed by Doctors and enjoyed by thousands. Drain the chick peas and blend all ingredients in a food processor for 3 to 5 minutes at low speed until the mixture becomes smooth. Place on a serving dish, sprinkle with olive oil. Garnish with parsley (optional). Serve with warm pita bread or chips. Refrigerate if you want to serve later.